- Selection of the year's most remarkable wines. - Individuality of the vintage. 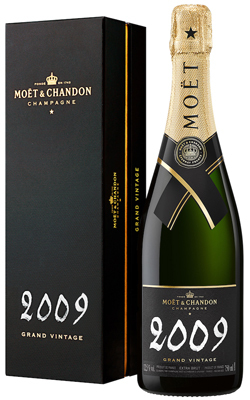 Moet & Chandon Grand Vintage 2009, the 73rd from the Maison, shows a light, appealing colour; Pale bright yellow, green reflections. The wine offers a fine, persistent bead with a fulfilling, reassuring bouquet. The first impression is that of an obvious and reassuring maturity. Gentle and comforting, initial nuances of harvest notes and notes of callisson and vanilla gradually expand into darker, toastier notes of grilled sesame seeds, roasted almonds and mocha. Concurrently, hints of juicy, fleshy fruits create a deeply warm, serene atmosphere reminiscent of an orchard of peaches and apricots in the middle of summer. The floral scent of roses and peonies rounds out an ensemble of radiance and delicacy. Following several vintages in which Chardonnay was dominant, Pinot Noir has taken the spotlight in 2009. The wine's controlled power is the very backbone of the vintage and the proportion of Pinot Noir has not been this high since 1996. As with every Moët Grand Vintage since 2002, dosage is 5g/l (extra-brut) and the wine has been aged for 7 years in the house's cellars and for at least six months post-disgorgement. Following one of the coldest winters in 15 years, springtime was free of frost but particularly rainy with episodes of severe storms. All of these issues were forgotten in mid-July thanks to the consistently hot, dry, sunny weather. The harvest took place during the habitual dates, beginning on September 12th in Aube and in the Epernay area to the 28th in Verzenay. In the end, the health of the grapes was exceptionally good, even better than in 2008, with no signs of Botrytis. The combination of an ideal climate and a moderate yield of 12,000 kilos per hectare created conditions for a high degree of ripeness, both in terms of sugar content and acidity, yet neither in excess: relatively even with regard to the red grapes (9.8 % potential alcohol / 7.5 total acidity) and slightly riper for the Chardonnay grapes (10 % potential alcohol / 7.2 total acidity). Rather similar to 2002. Interestingly, the fact that these indicators remained balanced throughout the harvest was a sign of perfect maturity levels and well-ordered picking schedules. Moët & Chandon: the world's leading champagne brand. With access to the region's most extensive vineyards and centuries of expertise, the Moet & Chandon name guarantees excellent and consistent quality through every bottle of Moët Imperial, Rose Imperial and Grand Vintage champagne. Moët is the champagne of those who live a fabulous life and have celebration as a part of their lifestyle.